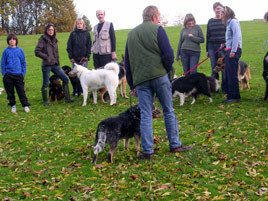 The group training classes are intended to address the majority of issues you may have when your dog is on a lead, or in close proximity to you. I understand that for many people controlling their dogs off lead is a very different matter. With this in mind my Saturday afternoons are dedicated to dealing with such problems. 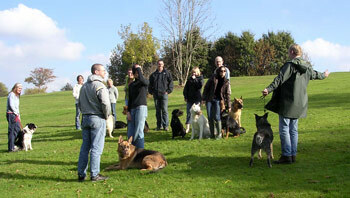 For the majority of people the root cause of problems is the lack of contact with other dogs. This can result in either aggressive, fearful or just excited behaviour.My group walks are intended to provide your dog with off lead contact around other dogs. 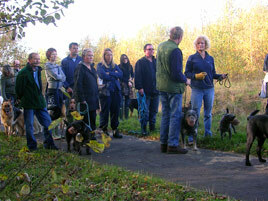 Also to advise you where necessary how best to improve both the control and social skills your dog may be lacking. In addition to the practical benefits the walks allow people the time and opportunity to chat to others in a similar situation or ask my advice about other issues which class time does not permit. If you would like to join us. Please ask for more information about times, location and cost. Please be aware that Group Walks are only open to people who have attended class.